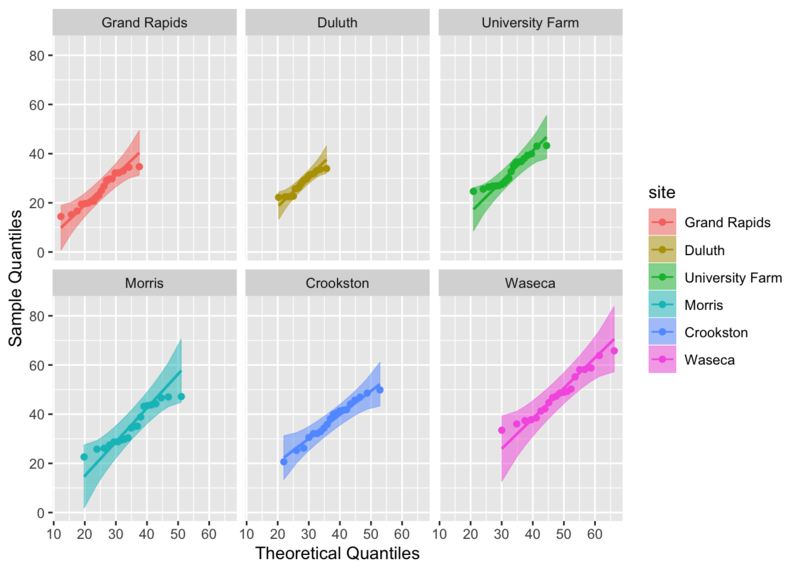 Extensions of 'ggplot2' Q-Q plot functionalities. The qqplotr package extends some ggplot2 functionalities by permitting the drawing of both quantile-quantile (Q-Q) and probability-probability (P-P) points, lines, and confidence bands. The functions of this package also allow a detrend adjustment of the plots, proposed by Thode (2002) to help reduce visual bias when assessing the results. The functions of this package, implemeneted as Stats from ggplot2, are divided into two groups: (1) Q-Q and (2) P-P plots. Both groups are composed of three functions: point, line, and band. Those Stats complement each other when drawn together, but they may also be plotted independently. Below we will give an overview of all those Stats and, further in the document, we will present some usage examples. stat_qq_point This is a modified version of ggplot2::stat_qq with some parameters adjustments and a new option to detrend the points. stat_qq_line Draws a reference line based on the data quantiles, as in stats::qqline. "ts" constructs tail-sensitive confidence bands, as proposed by Aldor-Noiman et al. (2013). In order to facilitate the visualization of multiple Q-Q band methods at the same time, the geom_qq_band Geom was also implemented. Its usage will be illustrated further below. 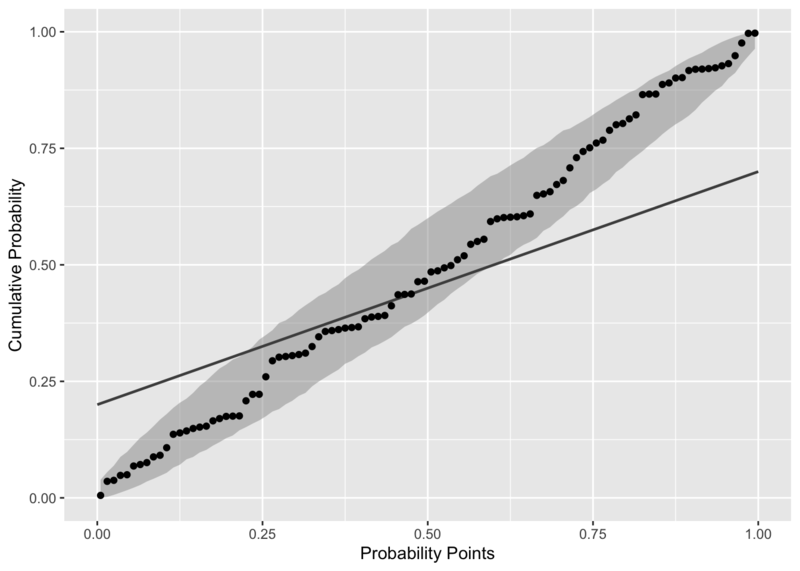 stat_pp_point Plots cumulative probabilities versus probability points. 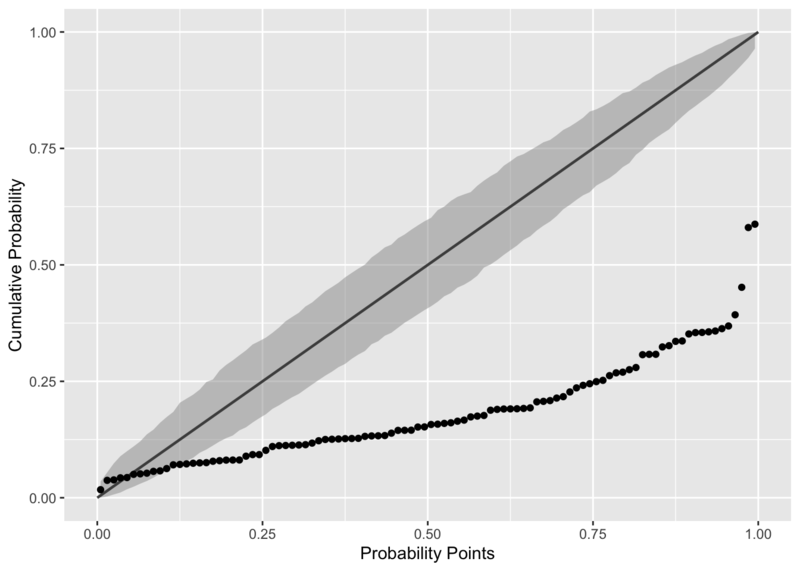 The cumulative probability function is constructed with the sample data, and then evaluated at each probability point. stat_pp_line Draws a reference identity line ((x = y)). stat_pp_band Draws confidence bands. For now, only the bootstrap version ("boot") is available. As we can see, all the points lie within the confidence bands, which is expected for the given distribution. As previously described in the Details section, three confidence bands constructs are available, which may be adjusted with the bandType parameter. Here, we may use the geom_qq_band instead of stat_qq_band, which permits a little more flexibility with the graphical parameters when constructing and visualizing different confidence bands. 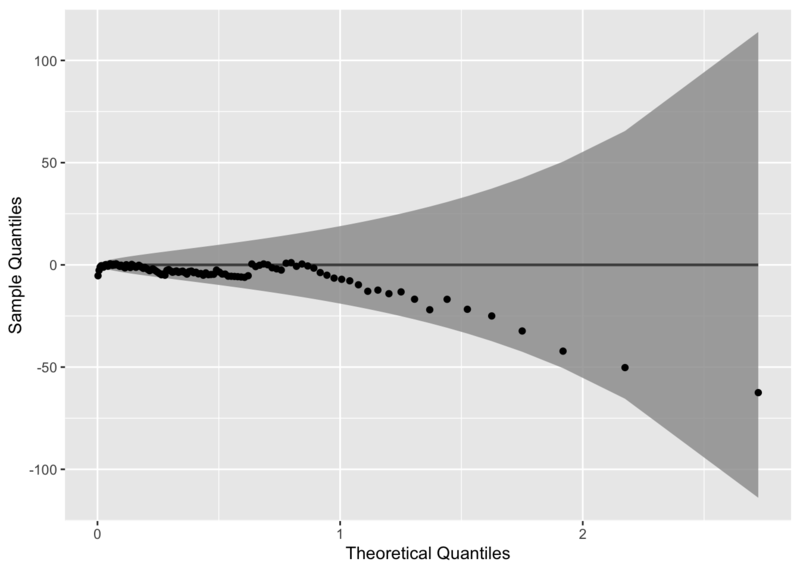 To construct Q-Q plots with other theoretical distributions we may use the distribution parameter. Specific distributional parameters may be passed as a list to the dparams paramater. Q-Q plots, as changing them will only modify the x-axis range. In contrast, those paramaters will have a higher effect on P-P plots. Now, let’s use draw the Q-Q plot functions for the mean ozone levels from the airquality dataset . Since the data is non-negative, lets choose the Exponential distribution (exp) as the theoretical. It is important to note that the distribution nomenclature follows that from the stats package. So, if you wish to provide a custom distribution, you may do so by creating the density, cumulative, quantile, and random functions following the standard nomenclature from the stats package, i.e., for the "custom" distribution, you must define "dcustom", "pcustom", "qcustom", and "rcustom" functions. Note that the detrend option causes to plot to “rotate”, that is, instead of being presented as a diagonal plot, we visualize the data in a horizontal manner. Notice that the label names are different from those of the Q-Q plots. 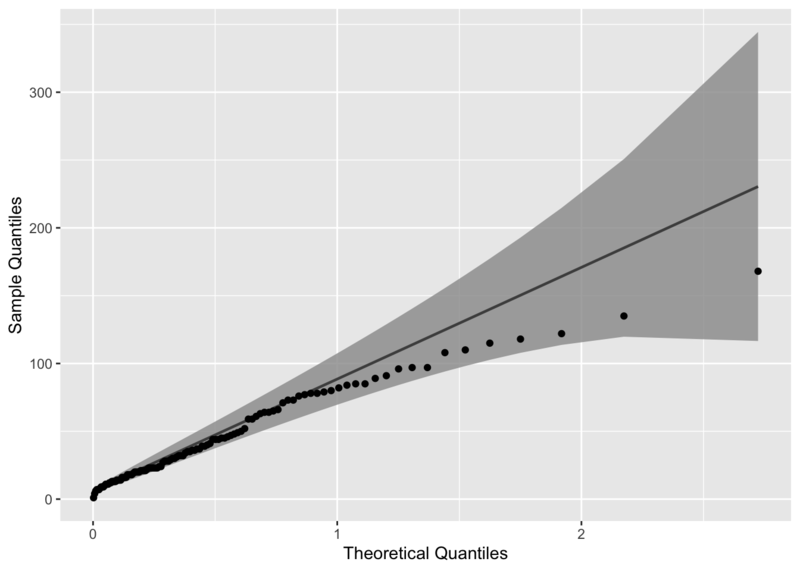 Here, the cumulative probability points (y-axis) are constructed by evaluating the theoretical CDF on sample quantiles. As we already know, the plot shows that the chosen Normal distribution parameters are not appropriate for the input data. 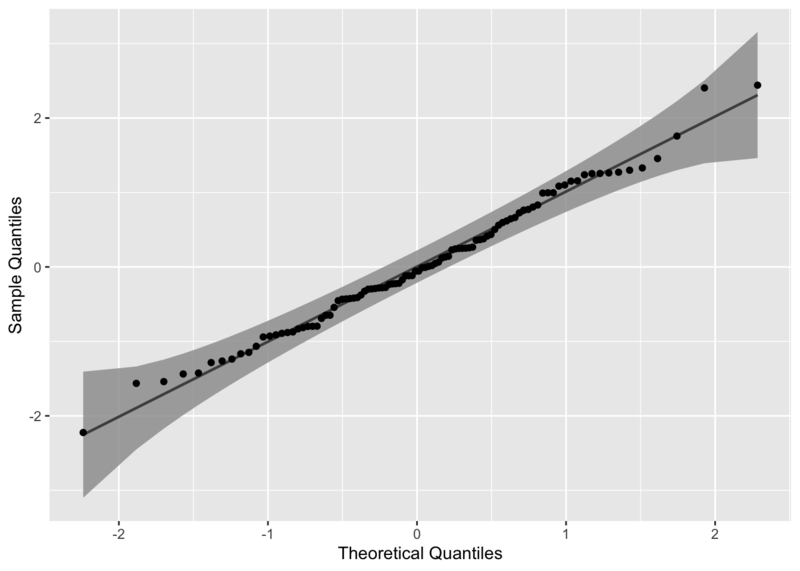 Based on empirical tests, we set the rate parameter to rate = .022. That value let the most P-P points inside the confidence bands. 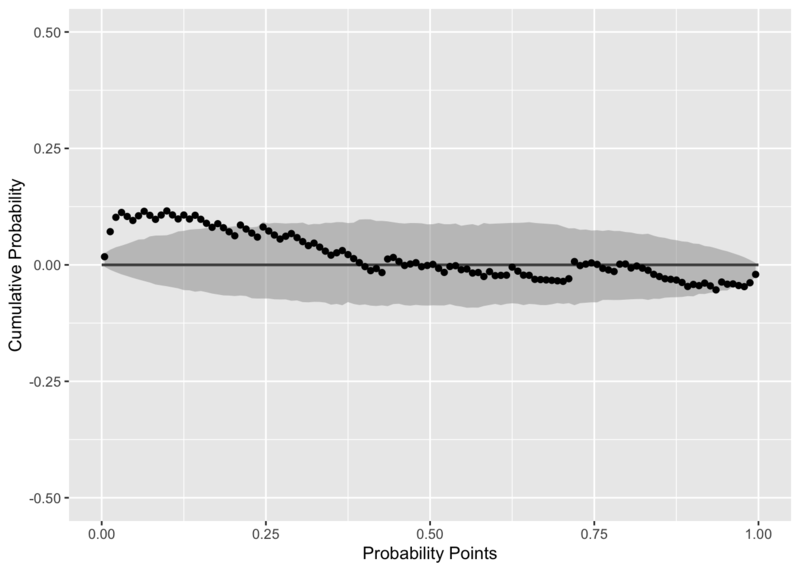 Even so, that group of outside the confidence bands (at the lower tail) indicate that a more appropriate distribution should be selected. Thode, H. (2002), Testing for Normality. CRC Press, 1st Ed. Aldor-Noiman, S. et al. (2013). The Power to See: A New Graphical Test of Normality. The American Statistician. 67:4. Added bandType = "ks", which draws simultaneous confidence bands based on an inversion of the Kolmogorov-Smirnov test. bandType = "pointwise" now produces pointwise confidence bands based on normal theory rather than bandType = "normal". Added the identity argument to *_qq_* functions, which permits to draw the identity line (instead of the usual Q-Q line). By default, distributional parameters are now automatically estimated with MLE for stat_qq_point, stat_qq_line, stat_pp_point, and stat_pp_band. Created a Shiny app to showcase the package functions and its parameters. Included error handling for most of the main parameters from all functions. Added partial match for most of the character arguments. Fixed a bug caused by stat_qq_line default colors when facetting. Removed most inheritances from Q-Q functions, as they were not actually essential. Added detrend option for P-P functions. Changed the P-P functions labels in the examples from the documentation. Implemented the P-P band stat stat_pp_band via parametric bootstrap. Created a description for the package itself, i.e., now ?qqplotr works. Implemented the P-P plot stats: stat_pp_point and stat_pp_line. Initial release of the package. 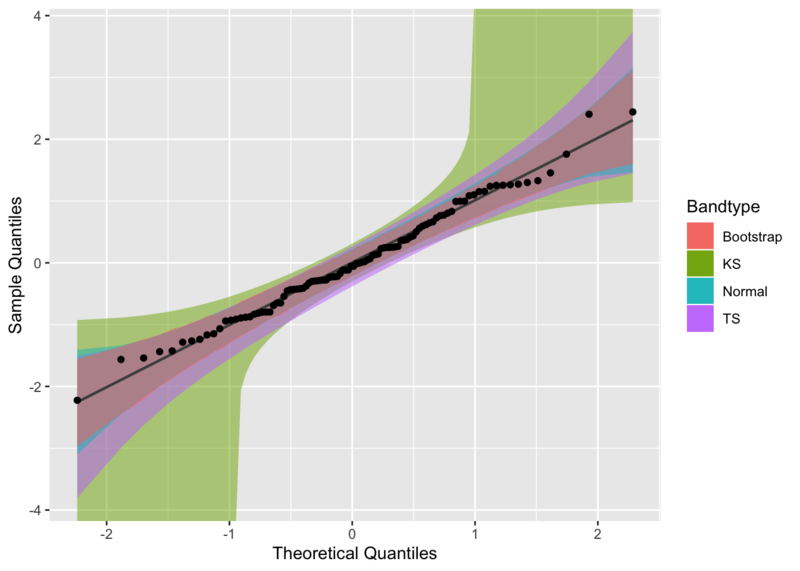 Implementation of three ggplot2 stats: stat_qq_point, stat_qq_line and stat_qq_band.